Raise your hand if you ever went through a rubber stamping/card making phase. *hand up in the air* Mine happened about 7 years ago. Maybe that's how this project idea came to me. As I was considering fabrics to use that would complement my "global wanderings" summer wardrobe theme, I searched all over the internet for "ethnic" print fabrics. Eventually I thought, why not make something myself? All it would take is a natural fiber fabric, a stamp with an appealing design, and an ink pad. Of course, I did have a little voice in my head saying, "Christina. Come on. Are you really gonna go down the art-to-wear road now?" Indeed, I recognized this could have gone way, way wrong. And if it did, I probably wouldn't have even mentioned it here. But I think it actually turned out okay! Judge for yourself. Main fashion fabric: Linen/cotton (50/50?) from Joann. 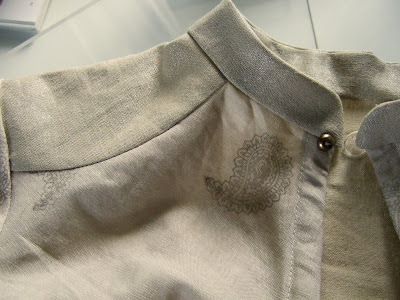 Shoulder/back yoke: Metallic-coated linen from Joann. Jacquard Pearl Ex ink is permanent on fabric. You just have to set it in with a dry iron. I chose silver because it's supposed to have a metallic sheen. 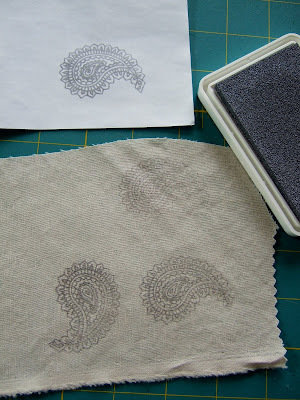 I bought the paisley stamp from Terbear on Etsy. I purposely avoided stamps that looked hand-drawn which would certainly scream "homemade." On paper the stamp looks nice and shiny, however on fabric it just looks grey, with no metallic sheen. Bummer. Still, the subtlety of the grey has grown on me. After I cut out each of my pattern pieces, I applied the stamp randomly. I used tracing paper to protect my work surface. This process takes a little bit of elbow grease but it's over soon enough. When am I going to learn to start measuring the flat pattern? Especially after my LA PR weekend roomie did my measurements last month, I have no excuse. The tunic turned out a tad bit shorter than I was wanting. I am toying with the idea of adding a "border" to the hem using the metallic-coated linen, just to give it a few more inches length. I'm worried it might disrupt the balance of the shirt though, I'm still deciding. The only alteration I did was to remove some of the sleeve cap ease based on some other reviews I've read of this pattern. Again, I finished seams as French seams and I covered the armhole and back yoke seam raw edges with bias fabric strips. 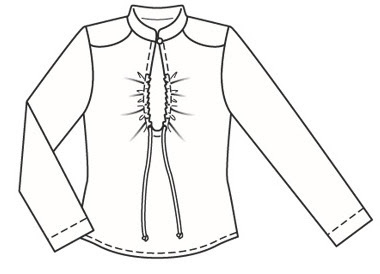 The neckline closes with a single button and button loop. I found this lone gold button in my stash that was the perfect size. The prescribed length of the drawstrings seems a bit short to me. I bought some natural colored twill tape with the intent of replacing them, but the color just doesn't look right. I'm going to keep my eye out for another appropriate replacement; I don't think I have enough fabric left to do more self-fabric bias drawstrings. I'm looking forward to wearing this one. Really nice job with the stamp. It doesn't look homemade at all. If you didn't tell us, I would have thought you bought the fabric like that. I think I have a tin of those stamps somwhere in the back of a cupboard. You blouse looks gorgeous, I am glad someone found something to do with all those stamps after that fad. Usually I don't like paisley at all but your design is so subtle I really like it. And no, it doesn't look homemade at all. 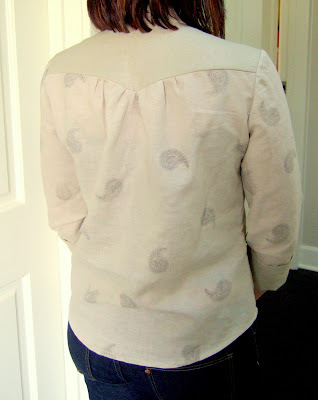 I can certainly share your concern over fabric stamping but I really really think that it turned out well. How is the metallic linen washed up? I saw it at Joanns and was drawn to it but it seemed stiff on the bolt. I think the stamped fabric looks fabulous! 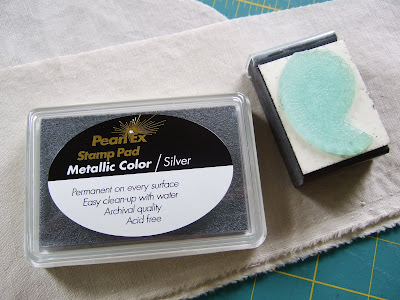 I have some of that metallic linen from Joann, I have the black/silver and the white/silver. Did you try stamping on the linen at all? The first thing I thought when I saw the first picture ...was how nice your fabric was . I loved the soft tone of the print...and you did it with stamps!!! I turned out great. 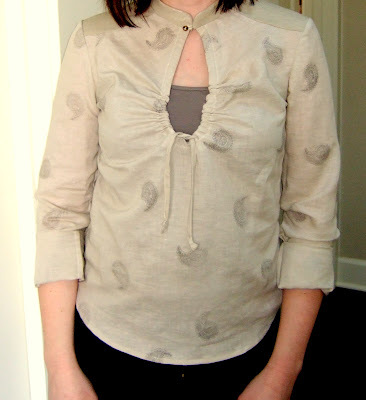 As you know I like this burda shirt pattern too! Nice touch with using the metallic linen. Very cute top and very much your style, I would say. The stamps look great. The stamped fabric is beautiful! What a great idea! What a great idea to stamp the fabric. I know what you mean about art-to-wear being a slippery slope. This is a big concern of mine, as well. But the effect of the stamping is very subtle and beautiful. Well done. Hm I never stamped anything on a fabric, but I kind of like the idea. I actually am thinking of a textile marker for some time having my friends drawing stuff for me on T-shirts... I think the colours on your shirt look great and the print is pretty. Normally I will always go for the band at the bottom, but I actually think I like this shirt more the way you have now! Stamping fabric has been in the back of my mind for years. Your project looks great and may be just the inspiration/motivation I need. 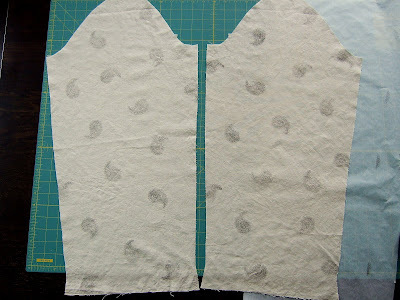 The fabric stamp idea is fabulous and you executed it well. The blouse looks great on you. Beautiful! I agree with the comments that I never would have known you stamped it- it looks like the fabric came to you that way! I took a screen printing/stenciling/stamping class here in Chicago a while back and didn't do much with it afterwards, this is a great application of that- great inspiration! loopylulu - The metallic linen is still fairly stiff after washing. I think it's best for more structured garments... I'm planning to use it to make a bag. paula - I didn't see the black color! Just the natural, white, and silver. Good find. No, I haven't tried stamping on this, my hunch is the coating would prevent the stamp ink from soaking in, but who knows. It looks great! I can't believe you stamped the fabric yourself. It turned out beautiful. I must say, I was wincing as I scrolled down the page, but your stamping looks great! It looks like they were always part of the fabric. Subtle and classy, and that's not something you often hear with stamping! Let me know if you are still interested in some ethnic prints. My daughter picked out a great cotton print with just the teeniest bit of lycra in it from Metro Textile here in NYC, but then changed her mind about it (she's 15 and changes her mind a lot). It's fabulous fabric, perfect for a skirt or top. Christina this top turned out fabulous! For me crossing the art-to-wear line involves using so much embellishment it takes away from the lines of the garment. I think you used it to create the look you wanted, not as a canvas for 'look how great my stamping is'! You are my hero. :-) I love how you combined the metallic linen (too bad the stamp didn't come through as metallic too) with the fabric, and what a nice button loop! Did you make it a la Susan Khalje? Leslie - No... I didn't make the button loop myself because I didn't have you around to remind me how to do it! I just used some purchased cord. You are officially a rock star! 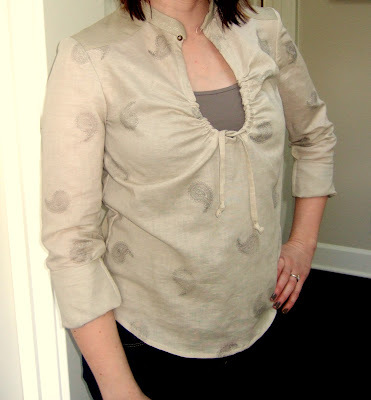 I love that you printed the fabric yourself (it's GORGEOUS) and the shirt is just beautiful - that neckline is amazing. Congratulations on another gorgeous piece! This is too great! What a fantastic idea. What a gorgeous top! I never would have guessed the fabric was hand stamped. It turned out beautifully. I love that you made your own fabric ~ very kewl! I personally don't think there is anything wrong with the length but did it pass the wearability factor? great idea on the handstamping. It looks good! So cute! Love how you handstamped it! I would have never guessed! That is a really neat idea! Not over the top, very elegant and subtle with the stamping. Nice work and a wonderful addition to your wardrobe. Carolyn - I've worn this around the house and it does pass the wearability test. I guess I just prefer the extra length insurance but this will do! Christina, the black is amazing. I have a picture of it on my blog. The picture's not the greatest, but you'll get the idea. It's beautiful, Christina, and you really did a nice job with the stamp! I was going to make this shirt last year, out of a black gauze, but I didn't have the time then. Maybe I'll make it for this spring! Thank you for the inspiration! Shame about the stamping not being metallic on your fabric, but it still looks pretty cool!